We received complimentary products to facilitate this post. All thoughts are my own. I’ve always been a huge fan of games, especially as a way to encourage family time together! As our boys are growing older, ages 3 and 5 now, it’s exciting to find new games that they can enjoy and have fun with. 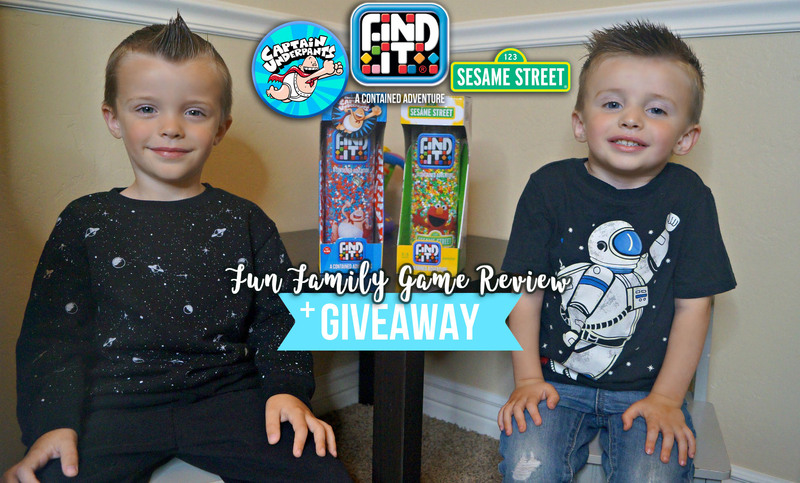 We recently had the opportunity to test a couple fun games in the Find It® family- Captain Underpants and Sesame Street Jr. Boy were they a HUGE hit with our boys! Andrew loved the idea of the silly theme of Captain Underpants (and is quite excited for the movie!) and Aidan loved the fun, bright colors and characters of the Sesame Street Jr. version of the game. Both offer something unique and different and the boys really loved both! It’s so much fun playing with them and what’s great about the Find It® games is the boys can be play solo, with each other, or all of us together as a family! Let’s take a closer look so you can see what they offer! The Sesame Street Jr. Find It is designed with younger children in mind. Filled with a variety of bright colors and large game pieces, this version of the game is challenging for Aidan but not too difficult. It comes with an instructional booklet with photos of the items to look for-no reading necessary. Small children can match the picture in the booklet to the character or object items in the game. This version of the game also features larger pieces so it’s easier for little ones to spot. The gender neutral theme of Sesame Street Jr. appeals to both boys and girls! The Captain Underpants Find It game is designed for bigger kids. It includes a set of cards that have clues for what to look for. Some clues are about a specific item while others are more abstract (find something round). The cards are two-sided for extra fun! Part of the challenge of this game is that everything is red, white, and blue. The items to look for are also smaller. Both of those attributes make the game more challenging while still achievable. This game includes a variety of pieces from characters to objects. Any kid who is a fan of the movie will love this game! Find It has taken the idea of Hide and Seek and brought it to life in the form of a game that is always available. Each Find It game has a theme. The theme includes a variety of items that relate to it and they are mixed in with small plastic pieces inside a clear cylinder. To play, you can shake, roll, and turn the cylinder around and as you move the small plastic pieces, you are able to find the items hidden inside. There are many varieties of Find It games and the latest include Captain Underpants, Sesame Street Jr. and Where’s Waldo (which is the one that I want!). The games are fun for people of all ages, but Sesame Street Jr. was carefully designed specifically with smaller children in mind so they can get in on the fun as well! What I love about the game is that it comes with very few pieces, so it’s easy to keep all together. I shared photos above of the Sesame Street Jr. booklet as well as the Captain Underpants playing cards. If you are a parent, you’ll understand that sometimes, despite your best efforts, pieces can get lost…which ruins the game. Well, Find It games thought of everything because on top of each game cylinder, you’ll find a list of all of the items inside so you can still play no matter what! Our boys seriously LOVED these games! I loved them having something that was hands-on that they could hold while also having a mental challenge. I feel like Find It games are so perfect for hand-eye coordination and help children develop quite a few skills while having fun in the process! Both Andrew and Aidan have been asking to play these games every day! As soon as they get home from preschool and kindergarten, they ask me to get the games out for them from the activity closet. They love playing together and also by themselves. The most fun is when we get to play together! It’s great to have such a simple game that contains hours of fun in one convenient container. It means we can sit down and get started right away. With Find It games, there’s no time limit. You can play for 5 minutes or an hour–whatever you want! You can also play the same game different every single time. And even if you find one of the pieces, you can shake it up and you get to find them all over again. I love seeing how much fun Andrew and Aidan have with these games and they are on our packing list for the next road trip! I definitely recommend these games to families, kids, teachers, and anyone else who loves some great fun! Find It games range in price from $20-23 and are available for sale on their website at www.finditgames.com and if you buy 3 or more, you get FREE shipping! Be sure to also follow Find It games on Facebook, Instagram, and Twitter to keep up with all the newest game releases! It’s giveaway time again! Enter below for a chance to win one of the new Find It games. Choose from Sesame Street Jr., Captain Underpants, or Where’s Waldo. Giveaway will run until Oct. 5th at 6pm MST and us open to US residents only. “Giveaway only” or spam accounts will be disqualified. All entries will be verified and a winner will be announced on my Facebook page within 24 hours of the contest end. The winner will have 24 hours to claim their prize or an alternate winner will be selected instead. Prize will be fulfilled by the brand’s PR agency. Please allow up to 4 weeks for prize delivery. Good Luck! Which of the THREE new Find It Games do YOU want? Previous post Andrew’s Big Kindergarten Update!